St. Joseph is a powerful patron. He is, as John Paul II called him, the Guardian of the Redeemer. He humbly accepted his role as guardian, husband and father in the Holy Family. Therefore, St. Joseph’s intercession has been sought for centuries. St. Joseph was clearly very close to our Lord and so we come to him with this novena with a sense of humility because of his great humility. There are actually a few different feast days for Saint Joseph, but March 19th has been most celebrated as his feast day in Western Christianity. But of course, you can pray a novena to him anytime. I started this novena a month and a half after my husband was released from his job. He had one interview but no job offers. Thankfully on the 7th day, he received a job offer and starts his new job and career a week from tomorrow. Thank you St. Joseph and the Lord for hearing my prayers! St. Joseph Terror of Demons, Pray for us! Most of everything we know about Saint Joseph comes from Scripture. There is some disagreement about his genealogy, but both Mark and Matthew say his descent is from David, the greatest king of Israel — and yet, he was a very humble, working man. He was a carpenter. 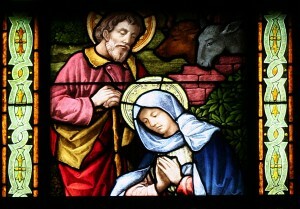 It is said that it was probably in Nazareth that St. Joseph was betrothed to and married Mary. After discovering that Mary was pregnant, also after their betrothal, he knew that the child was not his – and as such, he had planned on divorcing her quietly. However, an angel came to him in a dream and told him that the child Mary was carrying was the son of God. Immediately upon hearing this, Joseph took Mary as his wife. The angel came a second time to tell him his family was in danger, and he also reacted immediately by leaving everything behind him — his family, friends, and all that he owned — to go to Egypt with Mary and their newborn baby, Jesus.